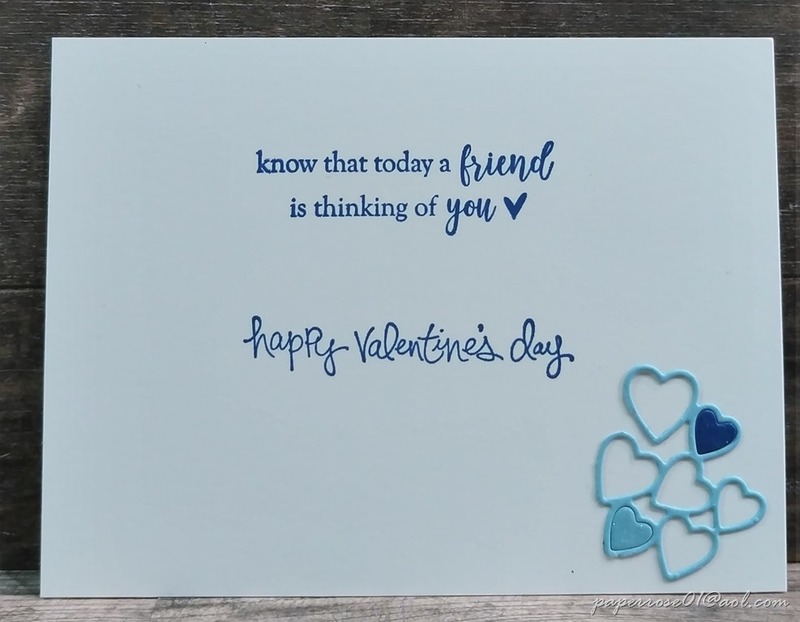 I know blue is not a traditional color for Valentine’s Day, but when I saw a Balmy Blue card by Hannah Townsend, I absolutely fell in love with it. I made some changes to mine, but I still love it. The card I cas’d from was all done in Balmy Blue and White. I chose to use Blueberry Bushel which highlights the Subtle embossed Balmy Blue. 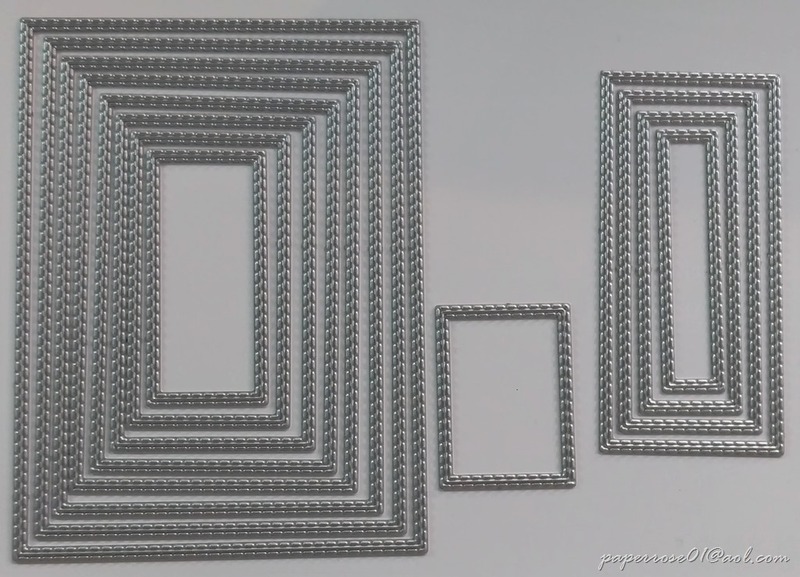 The new Rectangle Stitched Framelits Dies are also used on the first and second layers. I highly recommend the purchase of these dies. There are 13 stitched rectangle framelits dies in this set with the largest being 5 1/4 X 3 7/8 – perfect for a top layer as shown with the Balmy Blue above. This set can be found right here - Rectangle Stitched Framelits Dies. And if you spend $15 for additional products (remember extra 10% off paper), you can choose something free from the Sale-A-Brations pamphlet. The second sample of “My Blue Valentine” is very similar to the first. 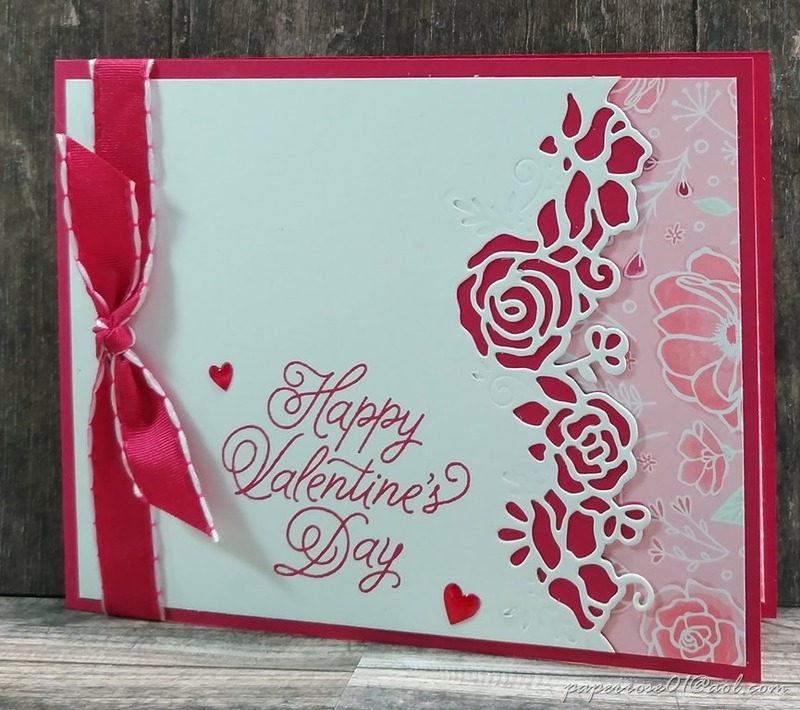 The row of hearts die for these cards is part of the new “Be Mine Stitched Framelits Dies.” Instead of die cutting and adhering one set of hearts, I took this to the next level and stacked a second set of hearts on top of the first using thick Whisper White as my card stock. This technique really makes the hearts pop. Although hard to see here, there is a small Heart Epoxy Droplet on the bottom right corner of each card. 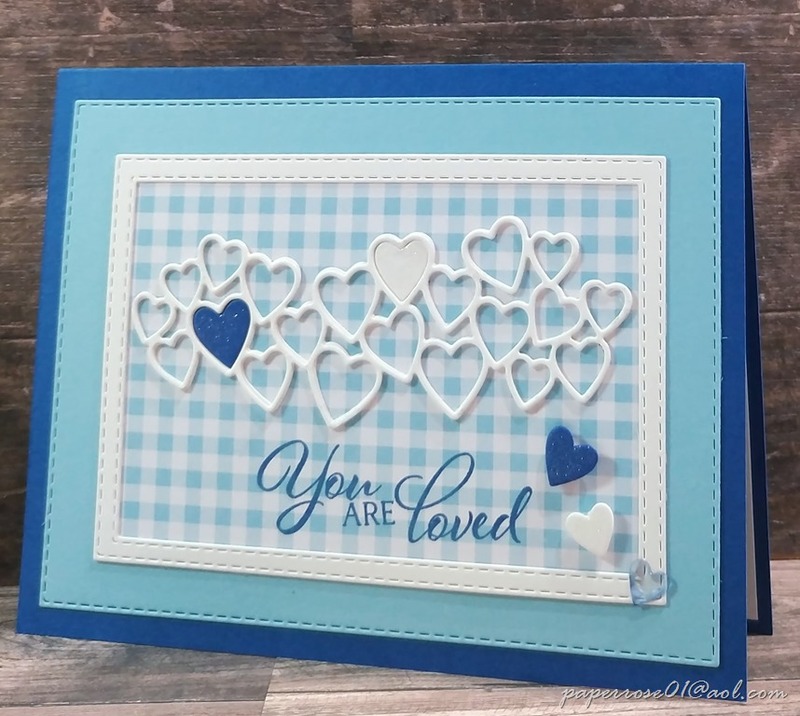 In the first sample, the heart was colored Night of Navy with Stampin’ Blends. We will be using these small hearts for February Stamp Camp and throughout the year. This is one of the message layers I stamped. This is perfect for sending to a friend for Valentine’s Day. Note the hearts in the bottom right corner. Using Balmy Blue, I die cut one of the row of hearts seen above and carefully cut it apart. You can get 3 small clusters of hearts by cutting it apart. Night of Navy and Balmy Blue Hearts provide nice contrast. 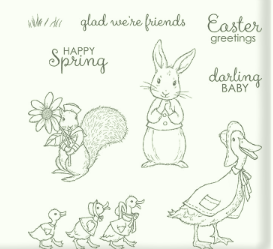 Stampin’ Up is now making CLING STAMPS. These look like the rubber stamps we have used in the past, but when the label is applied to the stamp, it becomes VERY VERY VERY sticky. This is great, but you must be VERY CAREFUL when removing the stamp from the block or Stamparatus. The stamp must be gently pried up from the label or it may tear. We will work with these cling stamps throughout the year and you will become comfortable with them. I hope you can come in out of the cold for February Stamp Camp – Thursday February 7th from 12 noon to 6 pm, Friday February 8th from 2 to 6 pm, and Saturday February 9th from 9 am to 4 pm. If these times don’t work for you, please let me know and we can rearrange the schedule. Hmmm…I was just reading that the color for 2019 is coral. Coral is okay in my book but I much prefer pink. 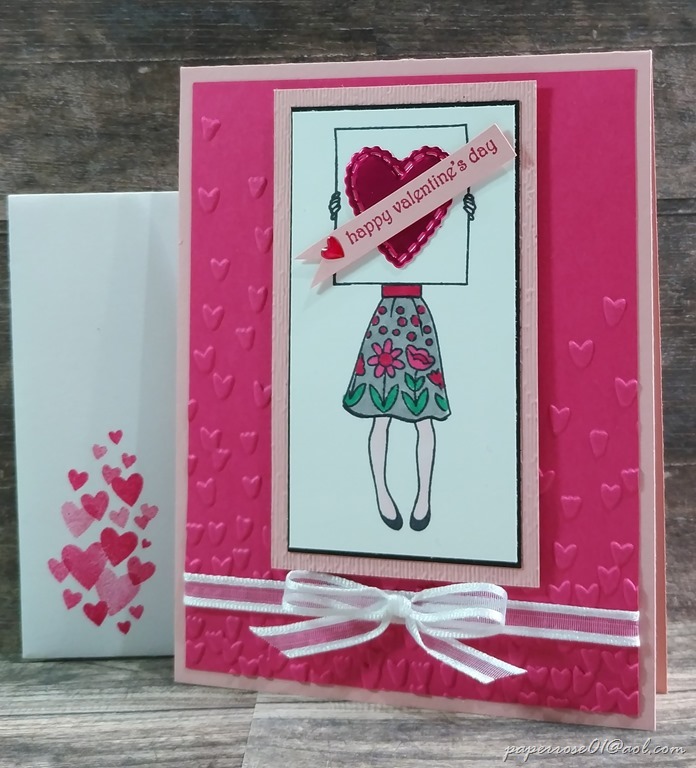 The Stampin’ Up Flirty Flamingo is a pinky coral and we will be using it on this card as well as another of our February cards. 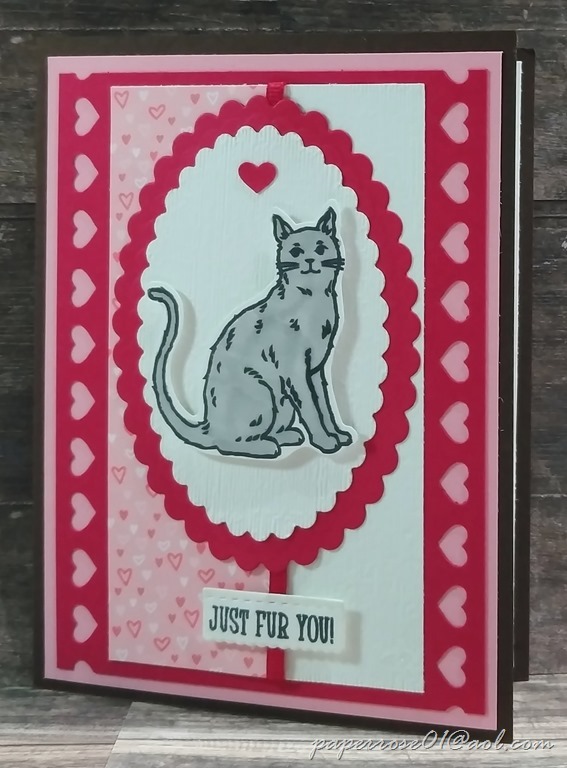 The next card/s is for the pet lover in our lives. I happen to be a cat person, but I know many folks have different pets and love them dearly. 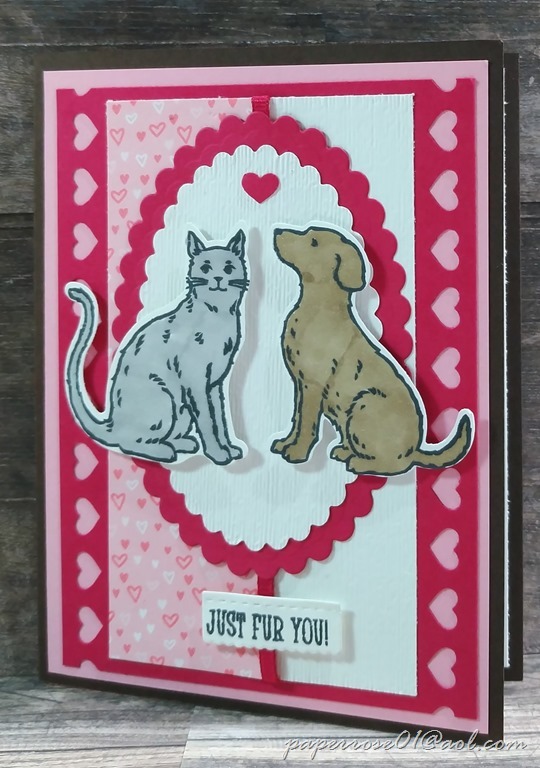 Our first card is for the pet lover who loves both cats and dogs. These new animal sets are found in the 2019 Occasions Catalog. “Nine Lives is featured on page 32 and Happy Tails is on page 33. These pets can be stamped as seen here or other images including spots and color variations can be used. In addition, there are assorted messages and other pet items that can be incorporated. There is a punch for the cat that we used last year and a new “Dog Builder Punch”. These are basic stamps and punches that never go out of style. I love some of the sentiments: “Keep calm and wag on, “A friend like you comes around ONCE in nine lives, “A Best Friend Leaves A Paw Print on your Heart,” and more. These stamps are great for any occasion. I can picture this done in red and green for Christmas with a red bow on the cat and a holiday leash on the dog. And finally, we see our pet pooch – perched regally on our card. A Lovely Lipstick leash would be cute stamped on his neck. 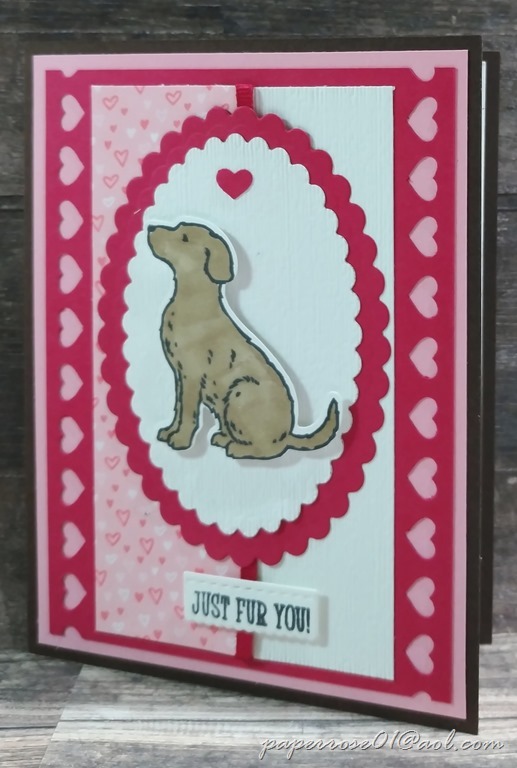 There is also a paw image stamp that could be incorporated on the front or inside of this canine card. I hope you can make it to our February Stamp. Although we have a valentine theme, these cards could be used for other occasions. February Stamp Camp will be held on Thursday February 7th from 12 noon to 6 pm, Friday February 8th from 2 to 6 pm, and Saturday February 9th from 9 am to 4 pm. If these times don’t work for you, please let me know and we can rearrange the schedule. Sale-A-Bration is taking place until March 31. With each $50 Stampin’Up purchase (before tax and shipping), you choose a free item from the current Sale-A-Bration brochure. To help you take advantage of Sale-A-Bration, for the month of February, I am discounting all Stampin’ Up cardstock/paper by an ADDITIONAL 10%. This means all card stock, DSP, foils, vellum, glimmer, watercolor paper, etc. will be 20% off. This is a discount offered by Paper Rose so orders will need to be placed thru me. You can see the pamphlet of freebies at 2019 Sale-A-Brations. As noted in the e-mail I sent out yesterday, I have made the decision to increase the price of Stamp Camp to $14. This was a hard decision to make, but everything is slowly rising in cost. I have kept the Stamp Camp price at $12 for years. 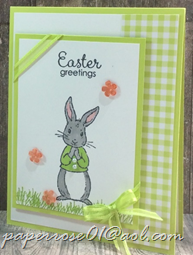 This allows us to continue using the high quality paper, stamps, dies and embellishments sold by Stampin’Up. The $14 covers everything – supplies, tools and my humor, knowledge and loving touch. Additional cards above the 4 for Stamp Camp will be $3. Stay warm my crafty friends! 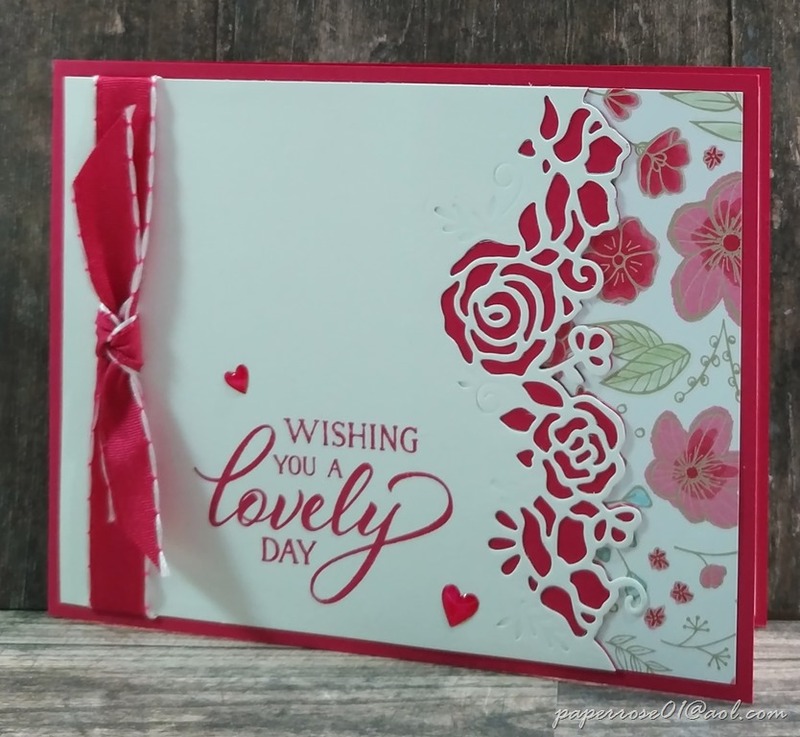 Hi Crafters and welcome to Stamping 2019 with Paper Rose! I’m happy to report I have recovered from pneumonia and slowly getting back in full swing. February Stamp Camp will be Thursday January 7th from 12 noon to 6 pm, Friday January 8th from 2 to 6 pm, and Saturday January 9th from 9 am to 4 pm. If these times don’t work for you, please let me know and we can rearrange the schedule. I have had to make a hard decision regarding the price of our stamp camps. I know you are aware how everything is slowly inching up in cost. I have kept the Stamp Camp price at $12 for years. In order to be fair to myself, I have made the decision to increase the price of Stamp Camp to $14. 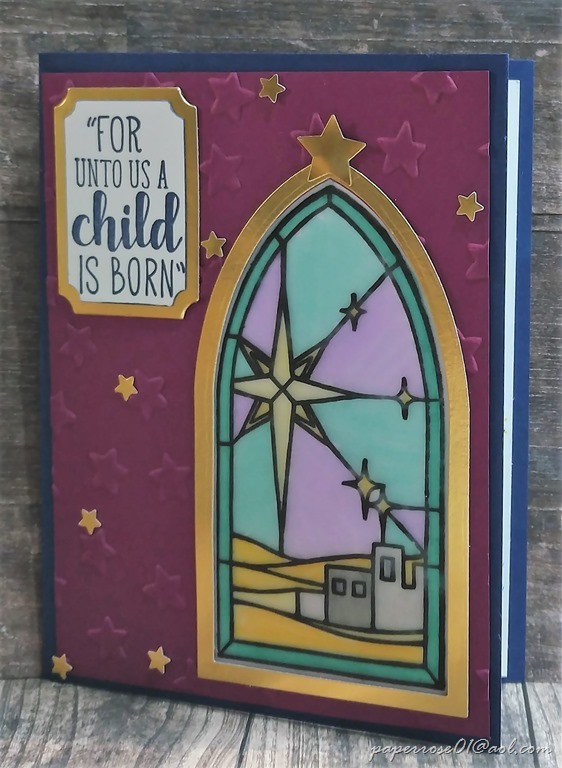 This allows us to continue using the high quality paper, stamps, dies and embellishments sold by Stampin’Up. The $14 covers everything – supplies, tools and my loving touch. Additional cards above the 4 for Stamp Camp will be $3. Sale-A-Bration is taking place until March 31. With any and each $50 Stampin’Up purchase (before tax and shipping), you choose an item from the current Sale-A-Bration brochure. To help you take advantage of Sale-A-Bration, for the month of February, I am discounting all Stampin’ Up cardstock/paper by an ADDITIONAL 10%. This means all card stock, DSP, foils, vellum, glimmer, watercolor paper, etc. will be 20% off. This is a discount offered by Paper Rose so orders will need to be placed thru me. And with every $50 purchase, you choose a free item from the Sale-A-Bration brochure. Many of you should have received your Sale-A-Bration brochures in the mail. I will have extra brochures at February Stamp Camp. Valentine’s Day is right around the corner. Although our February Stamp Camp cards have a valentine theme, they could also be used for birthdays, anniversaries, thinking of you, etc. We have lots of sentiments to choose from. The Sale-A-Bration foil sheets includes 8 sheets, 4 each of the 2 colors, 12X12 in size. The second sample shows a flowered skirt – different from the skirt in the sample above. There are 3 skirts available for this lovely lady as well as an assortment of items for her to carry. 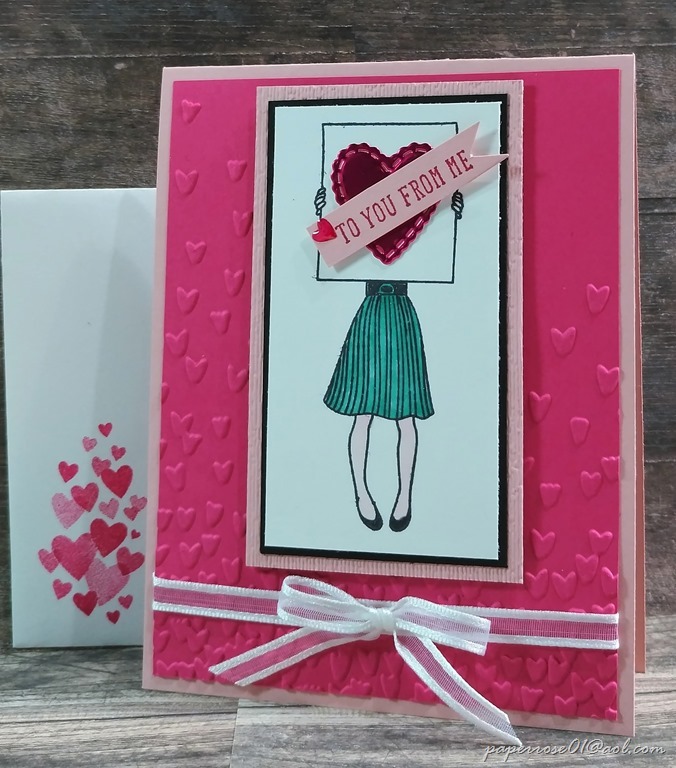 The small sentiment is stamped in Lovely Lipstick or Melon Mambo and features a small heart epoxy droplet colored with Stampin’ Blends in Lovely Lipstick. We will be using these little epoxy hearts on several of our February cards and throughout the year. I love the cute heart stamp shown here on the envelope. This is from the new “Forever Lovely” stamp set. 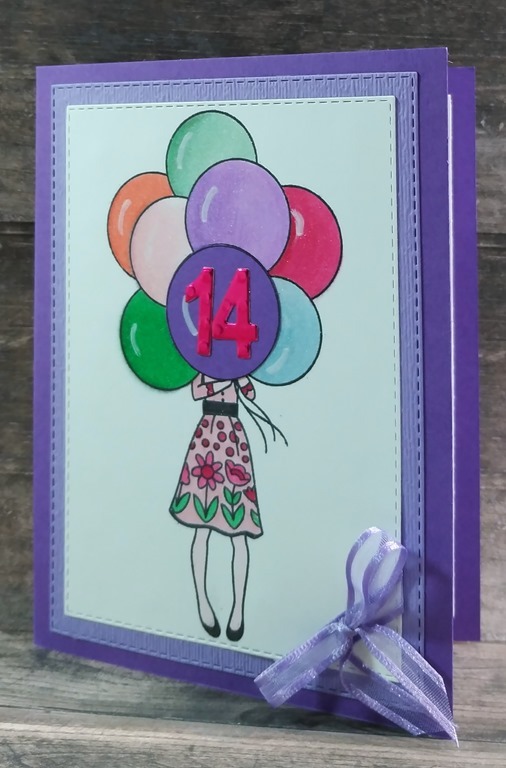 Although we are not making this card in February, I wanted to share the card I made for my Granddaughter Jailyn’s birthday. As you can guess, she turned 14. This is from the “Hand Delivered” set used above. Instead of a sign, our gal is holding an assortment of balloons. Other images for her to carry include a 3-layer cake and an armful of packages. 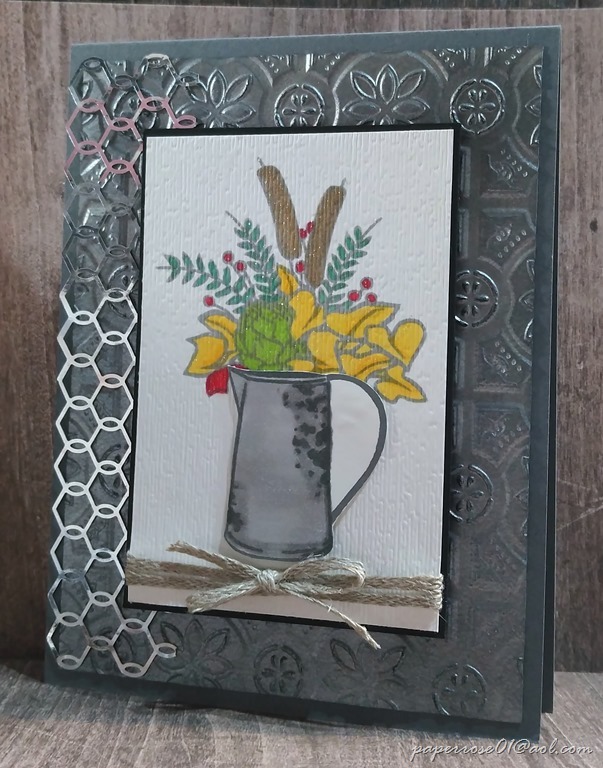 The image was colored with Stampin’ Blends. Note the stitched Highland Heather and Whisper White layers. 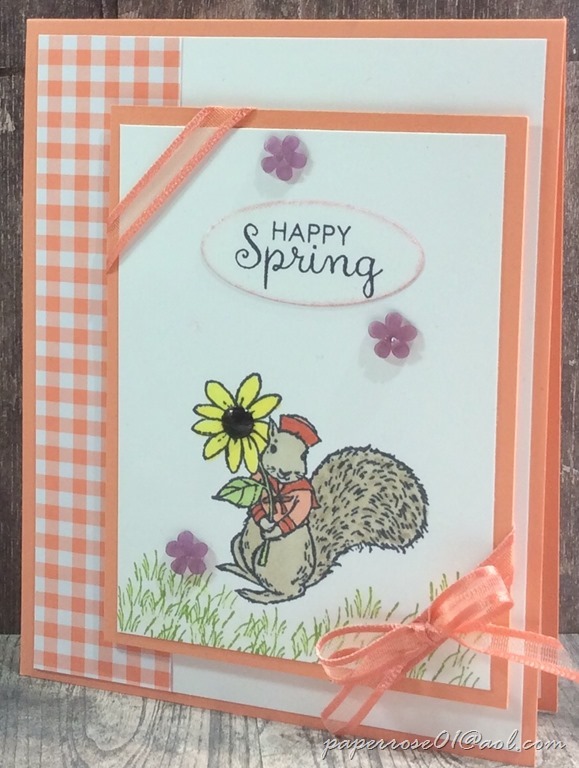 You will be using these new “Rectangle Stitched Framelits Dies” on another February card. 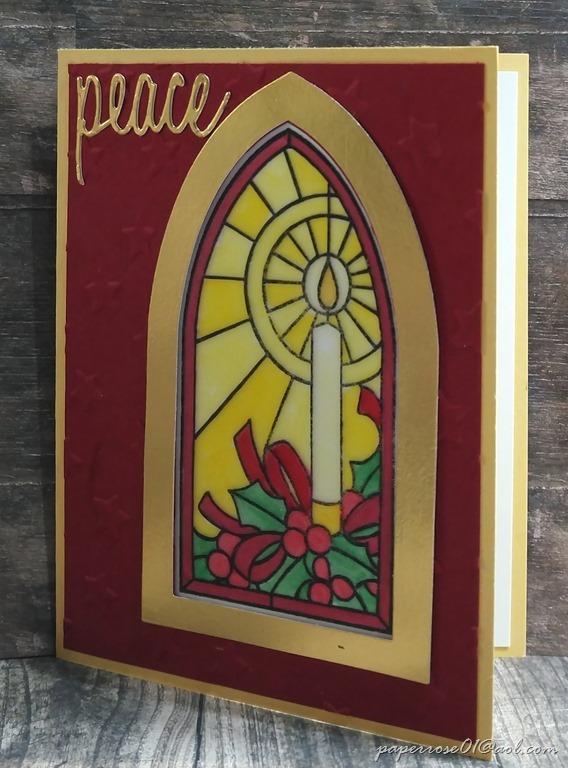 I love the professional finish from the stitched dies. I hope to see you at February Stamp Camp. Although it appears the weather will be a bit chilly these 3 days, there will be warmth and laughter inside 533 Emerson Circle. Stay warm – there are less than 60 days until spring.